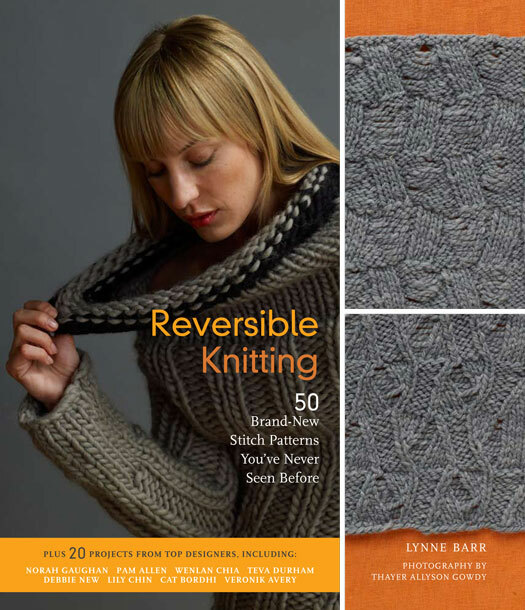 All of us at STC Craft were excited and intrigued by the response to our Reversible Knitting cover post. Over 550 of you shared your opinions about the cover we chose and the three runner-ups. So, for today's post, as part of the Reversible Knitting blog tour, I'm going to explain to you how we made our decision. All of the covers and the interior of the book were designed by Sarah Von Dreele, with photographs by Thayer Allyson Gowdy. For several weeks Sarah and I collaborated on the cover design in preparation for the meeting at which I would present the choices to the cover committee (a group composed of our CEO as well as individuals who hold key positions in sales, marketing, publicity, and editorial). The cover committee makes the final cover choice. Top left: Everyone loved this cover because of the great texture of Wenlan Chia's Winding Path sweater and because of the way it shows the two sides of the knitted fabric, plus the swatches of course. The cover committee was concerned that we might not be showing enough sweater and didn't like the model looking down (away from the customer). The Traveling Path sweater can be worn as shown on this cover as well as inside out and upside down (see bottom left cover and the gallery). Top right: Graphically, this cover (like the others in this format) works beautifully, however no one felt that Lynne Barr's Two-Tone Vest was as eye-catching on the cover as the other options. One of the cool aspects of this vest is that it can be worn with either side of the fabric right side out and with either side in front or back (check out the gallery to see what I mean). Bottom left: This cover, showing Wenlan Chia's sweater worn with the reverse side of the fabric outward (compared to the way it is being worn in the top left cover), was never a serious contender because it didn't show the swatches (such an integral part of the book) and because the color and graphic design seemed dull compared to the other options. That is why when I read everyone's responses, I was so surprised to find out how many people thought this was the best cover of all. I'll definitely keep this reaction in mind as we work on covers for future books. Bottom right: This was the cover committee's top choice because it is colorful, shows a beautiful garment with a reversible cable (Reverse Me designed by Norah Gaughan), plus the swatches, and because the model looks friendly and approachable. Overall, this is the cover that everyone believed said "Pick up this book and take a look inside" most boldly and that, of course, is a cover's main purpose. Thanks to everyone who commented . 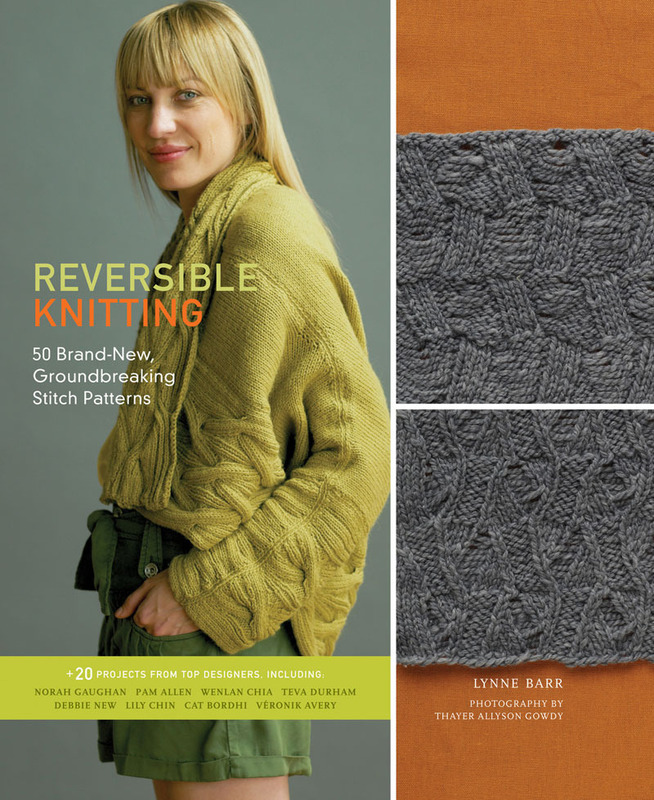 The winner of a copy of Reversible Knitting will be notified after the contest ends at 11:59pm on December 21, 2010. Meanwhile, if you have a few minutes, check out this fascinating Q&A with Lynne Barr here.